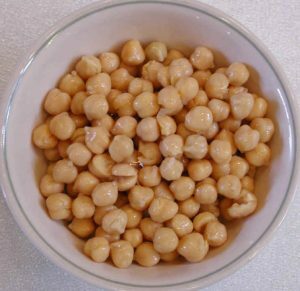 Chick Peas (Garbanzos), Canned are a staple ingredient to have in a vegan pantry, where they are convenient to add to a salad or make humus. Canned chick peas (garbanzos) are a quick way to enjoy this bean in salads and other recipes. The drawback to the canned variety of chick peas is that they are usually prepared with salt. We suggest that you drain off the liquid before using them. Mostly, we use canned chick peas on our salads, as a last minute treat. Chick peas are higher in fat and protein than other commonly eaten beans. See the nutritional chart below.